Whitewater rafting and outdoor rock climbing on the same day ??? 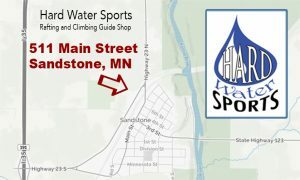 Hard Water Sports in Sandstone, Minnesota offers rafting and climbing on the same day. YES !! outdoor rock climbing and a whitewater river adventure on the Kettle River. 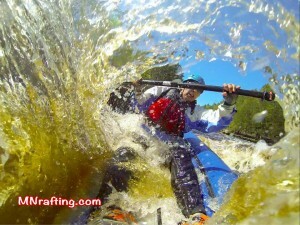 Whitewater rafting through Banning State Park on the Kettle River. We take on class III rapids including the Dragon’s Tooth and Hell’s Gate. The Kettle River tour is the perfect adventure – combining real adventure and the truly scenic beauty of the Minnesota Northwoods. Be prepared to get wet – we’re surfing and swimming and walking under waterfalls !! 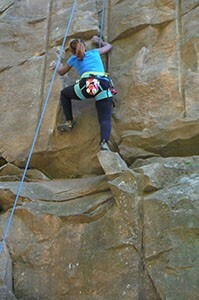 Your adventure continues with a guided outdoor rock climbing on the steep sandstone walls of Robinson Park. We provide the expert guide and all the gear for a safe rock climbing adventure. 2:30 meet back at the guide shop to get outfitted for rock climbing. 2:45 – 5:45 rock climbing !! kettle river rafting, minneapolis fun to do, minnesota climbing, mn rafting, raft and climb, sandstone mn. Bookmark.